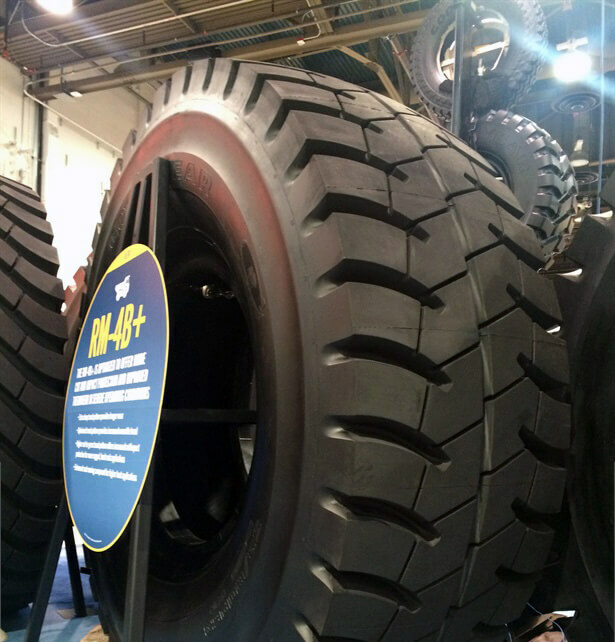 The Goodyear Tire & Rubber Company debuted its newest, ultra-large haulage mining tire at this week’s MINExpo 2016 in Las Vegas, Nev. Prominently displayed inside Goodyear’s MINExpo 2016 booth (#6009), the Goodyear RM-4B+ contains Goodyear’s latest technologies in materials, design, construction and manufacturing, and has been engineered to help mine trucks operate at optimal levels. said Eric Matson, global field engineering manager, OTR, Goodyear. An enhanced, cool-running compound, “which makes it ideal for high-heat applications,” according to Matson. This includes Goodyear’s exclusive EMTrack Performance Tracking system, which gives mining operations the ability to track critical data about the performance of their tires.